A good dinner salad hits the spot any time of year. In the cooler months, however, the lighter dressings I enjoy during the summer months don’t always satisfy. 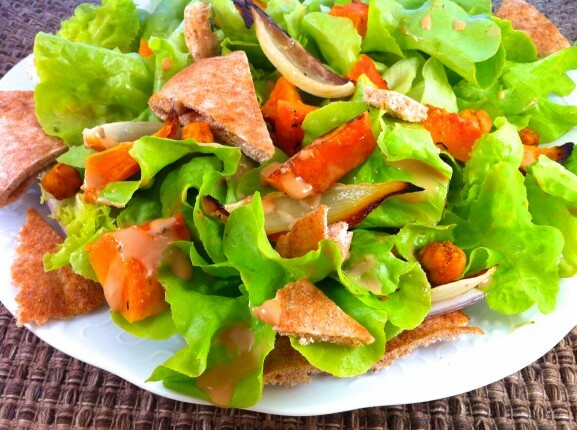 I created this Lemon Tahini Dressing to stand up to hearty root vegetables and winter squashes. In the process, I realized that it is a great option to other Asian-inspired peanut sauces and stands alone as a delicious dip. The use of coconut milk to thin the dressing keeps it light and wholesome. Leftover Roasted Butternut Squash with Feta works well in this salad. Also, I particularly enjoy a piece of Indian-Spiced Broiled Salmon on top. Try broiling enough salmon to have on its own one night — perhaps with the roasted squash with feta — then use the leftovers as a room-temperture salad topper the next. Instead of regular chick peas, you could also try a crunchy, roasted version. Click here to see a simple recipe incorporating the same spices. Use leftover roasted vegetables to make this salad super easy. Sweet potatoes are a great option to the butternut squash, and the addition of cooked chicken or salmon makes for a complete meal. This dressing makes a great dip for your favorite raw veggies and is a terrific peanut-free option to my Thai Peanut Dressing and other Asian-inspired sauces containing peanuts. Heat oven to 425 degrees. On a well-oiled baking sheet, toss the squash and onion to lightly coat, then arrange the pieces so they are spread out a bit with the flattest side down. Sprinkle lightly with salt and pepper and bake for 20-25 minutes or until the squash is just tender and golden brown on the bottom. Place desired amount of lettuce on serving plates or in a salad bowl. Top with the roasted squash and onions, chick peas, pita chips, and optional chicken or salmon. Drizzle with dressing and toss to coat. If you have leftover toppings, refrigerate and use for another salad later in the week. Combine all ingredients well and store in the refrigerator. If you would like to cook chicken or salmon at the same time, place on another baking sheet and cook boneless, skinless chicken breasts for 15-20 minutes and individual salmon fillets for 8-12 minutes, depending on size and thickness.